Reference number for this case: 14-Sep-54-Saint-Prouant. Thank you for including this reference number in any correspondence with me regarding this case. The fact goes back to last Tuesday, but such muteness was observed on both sides that it needed the indiscretion of a young workman so that the echo arrives from there to us. But for strange that it is, it therefore is not isolated, since it relates to an appearance of flying saucer, or more exactly of "flying cigar" in the sky of Saint-Prouant and Sigournais. Moreover the event is confirmed by many witnesses that we questioned and whose good faith and sincerity cannot be doubted. - It was approximately 5 hours of the sun, I was there in this field, when suddenly, from the cloudy sky where the storm went up, I saw a curious cloud emerging, blue-purple, and which had the shape of a carrot, coming towards us the point slightly ahead. - Was it indeed a cloud? - It seemed to me and my servant to be like a cloud, but it appears rather than it was a machine surrounded by vapor or an artificial cloud. Arrived at approximately 4 to 500 meters of us, and an equal height, it took the vertical position and became motionless. We looked at the phenomenon intensely. - And you were not afraid? - Of what? Moreover curiosity drove us. And then it is only after that I realized the strangeness of the event. "The cloud, or the apparatus was thus immobilized when suddenly, similar to the traces which a jet leaves, a white smoke was detached from the "tail" of the apparatus and is assembled in spirals, surrounding it of its orbs. The smoke arrived at the top returned down again, left in the other direction and it was at this time that a very shining disc, like a mirror, was detached and came while turning and while fluttering towards us, then to other places of the valley, before regaining the "apparatus" at a tremendous speed "quicker than a shooting star." The "carrot" then took an horizontal position, point ahead, and took again its course at an accelerated speed before disappearing from our sight. The whole was visible for half an hour approximately. - Mr. Louis Grellier, aged 36, servant in La Gabellière, confirms in all aspects this account, adding also some details about the walk of the famous disc. - At the nearby village, same statement by Mr. Mercier, Mr. Jean Perrocheau, aged 50, day laborer, several women who saw the "cloud" from the court of the farms, but could not see the "disc" because of the buildings. Mrs. Pizou, widow, aged 67, astute farmer who after having lost her husband and her son with the war, maintains her farm while waiting for the arrival of her grandson currently in military duty, was also witness to the appearance. - I was in the field close to Mr. Fortin, busy in "curving" the cabbages when my attention was drawn by this curious cloud. I looked at it with astonishment during all the time that it was above us, i.e. half an hour. It had the shape of a carrot with a kind of hat above. I saw a white smoke escaping and plotting drawings around it. - Did you notice a white disc? - Perhaps, but the trees obstructed me, because the "cloud" was right at their height. - But was this really a cloud, surely not, it was something else, but what? I saw it leaving then, after having become horizontal. There too, Mrs. Pizou's daughter repeats the statement of her mother, to which come to join the assertions of the day laborer who worked with her, and who also speaks about this "cigar" and of the spiral of smoke. Mr. Tissot, of La Lègerie, is also very affirmative, like also young Daniel Bornufart [Daniel Bonifait], electrician who was busy with the assembly of a power line in La Gabelière. In Libaudière, Godinière, Lègerie. Everywhere one gives us the same account and everywhere one speaks about a "carrot" which obviously points to the previous appearances of "cigars." Once again we attest the good faith of the witnesses, of which some had not seen each other since Tuesday, and some had never dared to speak about their appearance for fear to be accused to be fantasists and jokers. After The Fables [sic, Les Sables d'Olonne], and other places, will the Vendean sky become a place of predilection for the travels of cigar, saucer, and other celestial vehicles of which it is legitimate to wonder where the home port is? This is what Mr. Georges Fortin, a farm worker, saw on September 14 at 5 p.m., between the villages of Libaudières and La Gaudinière, the in Vendée. In (1), a cloud looking like a carrot emerged from the other clouds. In (2), a trail of white smoke jetted out from the base of the cloud, then a brilliant disc emerged, manoeuvered and renetered the cloud, which (3) then rose up and disappeared. 30 other people saw this together with Mr. Fortin. Here an original saucer in the carrot shape. Likes to coat itself with clouds which seems to adhere readily to its walls. Receptacle of brilliant discs which evolve around it. Observed by Mr. F... inter alia. Aimé Michel indicates that the Saint-Prouant case is still completely unnoticed in France, in 1958, except in the region where it happened, and that only one local newspaper wrote about it. On september 14, in Saint-Prouant near the coast of the Atlantic ocean in Vendée, the phenomenon was observed in broad daylight by hundred of witnesses spread across a half-dozen villages. "It was about 5 P.M. I was working in the fields with my employee when suddenly, from the heavy cloudcast where a storm was menacing, we saw some sort of luminous cloudiness of a blue-purple color emerge, which regular shape were reminding of that of a cigar or a carrot. The phenomenon had literally popped out of the cloud layer in an horizontal position, slightly bent towards the ground, point down, (like a submarine going underwater)." "This carrot-shaped "cloud" looked rigid. Each of its manoeuvers (which beared no relation to the clouds' own movements) was done in one operation, as if it really had been some sort of craft surrounded by vapours. It descended quite fast under the cloud layer down to an altitude which by comparison with the clouds, seemend for us to be of 400 à 500 mètres and a dictance which seemend to us as less athan one kilomer de nous. Il stoppa alors, tandis que sa pointe s'éleva rapidement dans le ciel. Quand il eut atteint la position verticale, il s'immobilisa." "During this time, the dark clouds continued to move in the sky, vaguely enlightened from below by the purple luminosity of the phenomenon." "It was an extraordinary display. We looked at it intensely. Everywhere in the countryside the other peasants too had dropped their tools and did what we did, the eyes turned towards the sky." "Suddenly - we had contemplated the immense motionless thing for several minutes - from the lower end of the cloud, a white smoke exactly similar to a trail of condensation spouts out. It initially rushed towards the ground, as if it was produced by an invisible shuttle which would have fallen in free fall, then slows down gradually by starting a change to level flight and finally went up tracing an ascending spiral which enclosed the vertical object in spirals. While the back of the trail quickly dissolved in the air, carried by the wind, its point thinned and was more and more tenuous, like taring little by little in its source, without the object which released it in the air - and that we were still not distinguishing - lost speed, on the contrary. It then goes up whirling to the higher point of the vertical object, then started to go down again while whirling in the other direction. And at this point in time, the trail having completely melted, which we saw finally the object which "sowed it": it was a small metal disc shining like a mirror and which reflects by glare the light of the large vertical object in its fast movements." "Deprived of its trail, the small disc ceased almost at once to turn around the luminous cloud and went down again towards the ground, but this time he was also moving away. During long minutes, we saw it fly above the valley at low altitude, moving at high speed here and there, sometimes accelerating, sometimes stopping for a few seconds, then setting out again. It thus crossed the area ranging between Saint-Prouant and Sigournais in all directions, the distant villages of approximately seven kilometers to flight of bird. Lastly, whereas it was within more than one kilometer of the vertical object, it finally accelerated once in its direction, this time at a vertiginous speed, and disappeared as a shooting star in the lower part of which it had come out. Maybe one minute afterwrds, the "carrot" inclined while starting, accelerated, and disappeared far in the clouds, having resumed again its primitive horizontal position, point ahead." "The whole had lasted approximately half an hour." Aimé Michel notes that Mr. Fortin's workman's name is Louis Grellier, who was 36 years old, and was also of La Gabelière. Michel indicates that he was interrogated separately and told an identical account, specifying additional details on the sudden changes of the disc. "Around 05: P.M., my attention was drawn by the arrival of a curious cloud in the shape of a carrot which seemed to have detached from the clouds layer which fled quickly, carried by the wind. It arrived not far from us, point ahead, then levelled. It seemed to me that above the carrot another smaller cloud was forming which capped the first." "At one time, a white smoke detached as if it was a wire, from the base of the vertical carrot and started to trace drawings around it. Then the trail moved away towards the valley, where what occurred then was hidden from me by the trees: I was told that a disc had come out of the trail, but I cannot say that I saw it, because of this curtain of greenery whose higher line, from the place where I was, arrived at about the base of the vertical cloud. Was this really a cloud? Certainly not in my opinion, for it remained motionless and always kept the same shape whereas the others clouds slipped above him at great pace towards the horizon." "Lastly, whereas I had looked at it for approximately half an hour, it lay down and left quickly in the direction where it had been inclined." Aimé Michel indicates that the account by Mrs. Pizou was completely confirmed by her daughter and a workman who worked near them, including confirmation for the operations of the cigar, the complicated drawing, the duration and so on. Aimé Michel indicates that at the same time, in the streets and the barnyards of Saint-Prouant, ten people among them Mr. Pérocheau, Mr. Mercier, women working with domestic tasks, all witnessed the arrival of the lying "cloud" lying and its change to the vertical, the gushing of the trail, the whirling course of the trail, but all were prevented by trees and buildings to see what occurred at low altitude in the valley, that is, the appearance and the operations of the disc. Aimé Michel indicates that on the other hand, peasants of the farms and hamlets of the valley, or those dispersed between Saint-Prouant and Sigournais, all confirmed the account of the first witnesses he names, these being Mr. Mr. Fortin and Grellier. He indicates that they saw the "cloud" arriving, some describing its slope orientation towards the left and others indicating its slope towards the right, depending of their own position relative to the "cloud." Among these witnesses, Aimé Michel cites the names of Mr. Daniel Bornufart [Bonifait?] who was working on a powerline at 5 hours in the afternoon at La Gabelière, Mr. Tisot who was in La Lègerie with several other people who were working with him. Michel indicates that other witnesses were a few hundreds of witnesses, peasants at work in the hamlets of Libaudière, Chassay, Coudrais, La Godinière and so on. Michel indicates that the weather was of low pression and saturated. Michel indicates that it has been put forthg that the phenomena was a cyclone. He notes that as astonishing as that can be that none the Vendean peasants would never have seen cyclones or would have been unable to recognize them, mistaking it for a flying saucer, that cannot be the explanation because the meteorologists were formal: there was no cyclone at all in this area nor elsewhere in France on September 14, 1954. We would have appreciated to know of other cases of silent motionless cyclones during half an hour, occurring under a uniform layer of cumulonimbus, getting themselves in horizontal poisition and releasing small discs with metallice reflections. Such cyclones probably would fascinate meteorologists. He discusses the explanation by collective hallucination, noting that such a thing would interest much the psychiatrists as much as the cyclone would interest meteorologists, because such an hallucination would be "positively miraculous." He adds, "but the true skeptic is fond of miracles." Michel Carrouges indicates that in Saint-Prouant in the Vendée, ON September 14, 1954, in full day AT 05:00 p.m., according to Aimé Michel page 29, George Fortin, aged 34, farmer, worked in the fields with his workman Louis Grellier, aged 36. The weather was very overcast and a storm threatened, when the two men suddenly see descending through the clouds of storm what Fortin described as "a kind of luminous cloud of a purple blue which regular forms evoked those of a cigar or a carrot", "a gigantic machine surrounded by vapors." This object advanced inclined like a diving submarine, then stopped, changed its position to a vertical position. This "cigar" remained motionless like this during several minutes under the storm clouds. All of a suden, something moved, which was "a white smoke exactly similar to a condensation trail" which came out of the lower end of the cigar, fell initially towards the ground, "as threaded an invisible shuttle which would have fallen in free fall", then becaome straight again and went back up in a spiral around the cigar while the back of the trail dissolved progressively. Once arrived at the top of the cigar, it again went down following a new spiral, but in opposite direction. "The trail having completely melted, we finally saw the object which "sowed it": it was a small metal disc shining like a mirror and reflective by glares in its fast movements the light of the large object." This small disc then moved away and flew on all sides above the surrounding countryside, between Saint-Prouant and Sigoumais, at a distance of approximately 7 km approximately, then returned "at a vertiginous pace" and disappeared "like a shooting star" in the lower part of the large cigar. One minute later, the cigar changed position from vertical to an angle again, went up and was hidden in the clouds. The author indicates that Fortin and Grellier were at 1 km of that thing, but that there were also Mr. Pizou, his daughter, and her workman, who were within 500 meters, in Saint-Prouant, and Mr. Pérocheau, Mr. Mercier, Mr. Tissot, and Mr. Bomufart, and others, which were dispersed in the neighbouring localities. September 14, 1954, Vendee, France. A farmer and his hired hands looked up at a thick layer of what looked like storm clouds, to suddenly discern a patch of blue-violet luminous mist in the shape of a "cigar or carrot." The eyewitness account continues: "The luminous cloud appeared rigid... and its movements had no connection with the movement of the clouds themselves... as if it were actually some gigantic machine surrounded by mists. It came down... to an altitude which we thought was perhaps half a mile above us. Then it stopped, and the point rose quickly until the object was in a vertical position, where it became motionless." Jacques Vallée indicates that on September 14, 1954, the phenomenon that started with the sighting by Mr. Miserey in Vernon reoccurred in broad daylight and was observed by hundreds of witnesses in a half-dozen villages 250 miles southwest of Paris, and that only one newspaper mentioned it. It was investigated only by chance, because the story came to Aimé Michel's attention. Vallée indicates that the witnesses were mostly farmers and a few priests and schoolteachers, and provides the same statement of one witness that Aimé Mcihel provided in his book. It was about five in the afternoon. Emerging from the thick layer that looked like a storm coming up, we saw a sort of luminous blue violet mist, of a regular shape something like a cigar or a carrot. Actually, the object came out of the layer of clouds in an almost horizontal position, slightly tilted toward the ground and pointing forward, like a submerging submarine. This luminous cloud appeared rigid. Whenever it moved, its movements had no connection with the movement of the clouds, and it moved all of a piece, as if it were actually some gigantic ma-chine surrounded by mist. It came down rather fast from the ceiling of clouds to an altitude which we thought was perhaps a half-mile above us. Then it stopped, and the point rose quickly until the object was in a vertical position, where it became motionless. During this time the dark clouds went on scudding across the sky, dimly lighted from underneath by the violet luminosity of the object. It was an extraordinary sight, and we watched it intently. All over the countryside other farmers had also dropped their tools and were staring up at the sky like us. All at once white smoke exactly like a vapor trail came from the lower end of the cloud. At first it pointed to the ground but finally rose up to describe around the vertical object an ascending spiral. While the rear of the trail was dissolving in the air and being carried off by the wind, the source of the trail went up to the very top of the vertical object and then started to come down again, turning in the other direction. Only then, after the smoke trail had vanished entirely, could we see the object that was sowing it - a little metallic disk, reflecting in its rapid movements Rashes of light from the huge vertical object. The little disk then stopped turning around the luminous cloud and went down toward the ground again, this time moving away. For quite a few minutes we could see it flying low over the valley, darting here and there at great speed, sometimes speeding up, then stopping for a few seconds, then going on again, flying in every direction between villages that were four miles apart. Finally, when it was almost a mile from the vertical object it made a final dash toward it at headlong speed and disappeared like a shooting star into the lower part, where it had first come out. Perhaps a minute later the carrot leaned over as it began to move, accelerated and disappeared into the clouds in the distance. The whole thing lasted about half an hour. The source of this report is given as Aimé Michel's book in English and French version. Testimony by M. Georges Fortin, farmer at "La Gabellière", at Saint-Prouant, Vendée. We meet the witness on the road of Gabellière, and he initially answers us with a certain reserve. At the sight of our G.E.P.A. membership card, he realizes that we did not come to turn ridicule him. He then tells us of his observation, quite vivid in his memory after more than ten years. Working in a bean field, at the end of the afternoon, under a not very cloudy sky, the witnesses has his attention drawn by an odd cloud in the shape of a carrot, white-yellow, which goes down slowly from the sky, tilted with 45°, pointed to the bottom, and which stops at about fifty meters of the witness and at approximately 6 or 8 meters above the ground. The size of this cloud is compared with that of a powerhouse of EDF [state power co.] which the witness shows at the edge of the road (a concrete building of 3 by 3 meters square base of 10 meters height roughly). During the descent, some kind of smoke escapes and is rolled up while going up around the cloud, in the manner of a corkscrew. After its immobilization, the cloud is dissipated little by little and it lets a brilliant ball appear (or a disc which would have always shown the same side towards the witness) from 35 to 40 cm in diameter. Then this ball carries out a impressing number of fast and jerked operations, consistent in a rectilinear way in another direction, movement going as well from the left to the right as upwards, following a non-flat broken line (1). Lastly, the ball goes up abruptly to the vertical and is lost in the altitude. The whole thing lasted twenty minutes. The witness has a negative memory of the investigation of the time, carried out by a journalist "tall, rude and unfriendly," whom questioned him only superficially and seemed to know better than him what he had seen. He is furious that one wanted to make him say things which he did not see, and that his statements were altered. Since, then, he has been interviewed only once, by letter, from a journalist of La Rochelle. His sighting is confirmed by other people, who were in very nearby places. Mr. Bonifait, electrician, did not see the disc, but only the odd cloud, which he saw coming by far as he was working on the top of a power pole. This cloud made him believe a sudden storm [sic], but he had been intrigued by the behavior of this cloud, completely unusual. He only witnessed its descent towards the ground, after what the cloud disappeared from his sight, hidden by trees. This observation of Saint-Prouant is thus not to be attached to those of the type of the large vertical cigar, as in Aimé Michel's denomination, but to that of small similar discs or to the "foo fighters" (2). 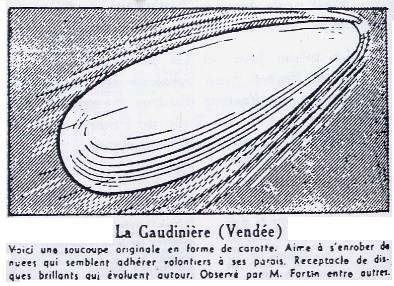 Jean Giraud indicates that the "cloud cigar" is one of the most interesting elements of the "flying saucers" phenomenon and that it was observed inter alia in Saint Prouant on September 14, 1954. He indicates that around 5 p.m., dozens of witnesses had been able to observe a luminous cloud in the shape of a carrot which emerged below the layer of clouds in horizontal position, slightly tilted downwards. This blue-purple luminous cloud had a rigid aspect. It descended quickly towards the ground and stopped when its point rose towards the sky. When it reached the vertical position verticlae, it immobilized. The source is given as "A. Michel". The Belgian ufologist indicates that in 1954, on September 14, in France in Saint Prouant in the Vendée, "Around 17 hours George Fortin worked in the fields when from the thick vapour cloud came out a luminous purple blue cloud whose regular forms evoked those of a cigar or a carrot. This form had a rigid aspect and its movements took place in block: like a gigantic machine surrounded by vapors, at 400 or 500 m of altitude. Everywhere in the countryside the other peasants had to drop their tools to look at it. Suddenly, the thing had been motionless for several minutes, a lower white smoke spouts out of the end which pricked initially towards the ground, as in free fall, then slows down gradually by starting to get level to follow an ascending spiral around the phenomenon. After other operations a small shining metal disc appeared which reflected like a mirror the glares of the large object (...) total duration: more than one half an hour. Other witnesses: Louis Grellier, Mrs. Vve Pizou, Misters Pérochau, Draper and their wives, Daniel Bonifait (follow-up on 24-7-67: Simon la Vineuse) etc." The sources are indicated as "Aimé Michel: 'M.O.C.' Seghers pub., p. 33 à 35" and "Aimé MICHEL: 'Apropos des Soucoupes Volantes', PLANETE pub., 1966, p. 29." This is what M. Georges Fortin, a farm worker, saw on September 14th at 5 p.m., between the villages of de Libaudieres and de La Gaudiaiere, in Vendee. (1.) A carrot-shaped 'cloud' emerged from other clouds. (2.) A trail of white smoke jetted out from the base of the cloud, then a brilliant disc emerged, and reentered the cloud, which (3.) then rose up and disappeared. 30 other people saw this together with M. Fortin. Another cloud-cigar event of considerable importance occurred in the late afternoon of September 14 near Saint-Prouant (now Talmont-Saint-Hilaire in Vendée Department) on the Atlantic coast, about 250 miles southwest of Paris. Due to the rather lengthy nature of the account, I will mention just a few brief details here. The primary object was cigar-shaped (some likened it to a carrot) and when in a vertical position it discharged a small disk. After maneuvering over a wide area, it returned to the cigar and reentered it. There were hundreds of witnesses scattered through half a dozen villages and surrounding fields. Despite only one local newspaper mentioning it, a reader informed Michel by mail of this event and an investigation was made. Luc Chastan indicates that in the Vendée in St Prouant on September 14, 1954 "Around 17 hours the witness worked at a fields when from the thick vapour cloud came out a luminous purple blue cloud whose regular forms evoked those of a cigar or a carrot. This form had a rigid appearance and its movements took place in block: like a gigantic machine surrounded by vapors, at 400 or 500 m of altitude. Everywhere in the countryside the other peasants had to drop their tools to look at it. Suddenly, the thing had been motionless for several minutes, spouts out of the end a lower white smoke which initially dove towards the ground, as in free fall, then slows down gradually by getting level to start an ascending spiral around the phenomenon. After other operations a small shiniy metal disc appeared which reflected like a mirror the glares of the large object. Total duration: more than one half an hour. Seven other witnesses." The belgian ufologist indicates that some reports of nocturnal cloud cigars can be explained as misperceptions [misinterpretation] of the crescent Moon seen through semi-transparent clouds, but he suspects that many of the reported vertical cigar-shaped lights were actually triggered by artifical light pillars created by gas flames, fires and searchlights, and the dozen or so daylight sightings have another explanation. As example of these, he says the most intriguing is from Michel's second UFO book Mystérieux Objets Célestes, published in 1958, in which hundreds of witnesses, scattered through half a dozen villages in Western France observed a "cloud cigar" over some fields in the afternoon of September 14, 1954. Van Utrecht explains that Aimé Michel talked of a peculiar type of unidentified aerial phenomena which has since become known as "the cloud cigar" (in French: "le grand cigare des [de] nuées"). Michel meant: a big, cigar-shaped object or light, often in a vertical position, and either cloud-like in appearance or surrounded by cloud-like structures. The idea is that the UFO produces these clouds in order to camouflage itself, a technique that, considering the large number of such incidents, does not seem to work very well... Cloud cigars are sometimes accompanied by small, disk-shaped lights - the so-called "scout-ships" - that either seem to emerge from or enter into the parent object - the so-called "mother-ship". "It was about five in the afternoon. I was working in the fields with my men when all at once, emerging from the thick layer of clouds that looked like a storm coming up, we saw a sort of luminous blue-violet mist, of a regular shape something like a cigar or carrot. Actually, the object came out of the layer of clouds in an almost horizontal position, slightly tilted toward the ground and pointing forward (like a submerging submarine)." "This luminous cloud appeared rigid. Whenever it moved (and its movements had no connection with the movement of the clouds themselves) it did so all of a piece, as if it actually were some gigantic machine surrounded by mists. It came down rather fast from the ceiling of clouds to an altitude which we thought was perhaps a half mile above us. Then it stopped, and the point rose quickly until the object was in a vertical position, where it became motionless." "During this time, the clouds went on scudding across the sky, dimly lighted from underneath by the violet luminosity of the object. It was an extraordinary sight, and we watched it intently. All over the country-side other farmers had also dropped their tools and were staring up at the sky like us." "It thus went on up, turning around, up to the very top of the vertical object, and then started to come down again, turning in the other direction. Only then, after the smoke trail had vanished entirely, could we see the object that was "sowing" it, a little metallic disk shining like a mirror and reflecting, in its rapid movements, flashes of light from the huge vertical object. "The little disk almost immediately stopped turning around the luminous cloud and went down toward the ground again, this time moving away. For quite a few minutes we could see it flying low over the valley, darting here and there at great speed, sometimes speeding up, then stopping for a few seconds, then going on again. In this manner it flew in every direction over the region between St-Prouant and Sigournais, villages about four miles apart. Finally, when it was almost a mile from the vertical object, it made a final dash toward it at headlong speed, and disappeared like a shooting star into the lower part where it had first come out. Perhaps a minute later, the "carrot" leaned over as it began to move, accelerated, and disappeared into the clouds in the distance, having resumed its original horizontal position, point forward. The whole thing had lasted about half an hour." "After it immobilized, the cloud dissolved bit by bit and a brilliant ball of light, 35 to 40 cm across, became visible (...) At the end, the ball rose brutally in the air were it disappeared from sight". Van Utrecht says that testimonies from other witnesses were also collected, and all give a similar account except for the detail of the shiny disk; which was observed only by Mr. FORTIN and his farm hand. The sources are indicated as MICHEL, Aimé, A propos des soucoupes volantes - Mystérieux Objets Célestes, Editions Arthaud, Paris, 1958, pp. 32-37, published in the U.S. in 1958 under the title Flying Saucers and the Straight Line Mystery; JAY, Dominique and METAYER, R.P., "Le 'cigare' de Saint-Prouant n'était-il qu'un nuage ?" in Phénomènes Spatiaux No. 18, December 1968, pp. 26-28. Phénomènes Spatiaux was published by the now defunct GEPA; TAYLOR, Herbert S., "Cloud cigars: A further look" in International UFO Reporter Vol. 30, No. 3, May 2006, pp. 10-12. Wim van Utrecht then explains the case by noting that all witnesses that were interviewed describe a cigar or carrot-shaped object emerging from a thick cloud layer, a perfect description of a funnel cloud, a term used to designate a tornado that is not in contact with the ground. He notes that Aimé Michel rejects this obvious explanation by arguing that "il n'y a pas eu de cyclone dans cette région le 14 septembre 1954, ni nulle part en France" ("there was no cyclone in that region on September 14, 1954, nor in any other part of France"), but that Michel confuses a cyclone with a tornado: A tornado is a localized rotating column of air emerging from the base of a cumulonimbus cloud, whereas the term "cyclone" is used to indicate a much larger area of low atmospheric pressure characterized by inward spiraling winds. 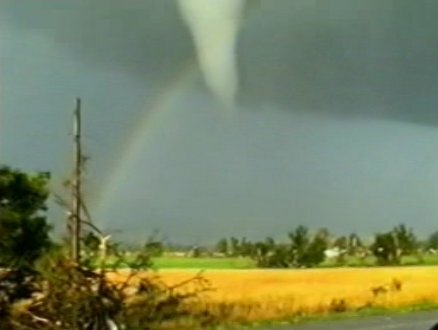 There may not have been a cyclone over Western Europe that day, but a local tornado or land spout is never to be excluded. Van Utrecht says the white smoke, "exactly like a vapour trail" was probably just that: the typical, rope-like cloudlets of water vapour that are often seen swirling around the main condensation funnel of a tornado. He notes that such vapour trails, also referred to as "satellite tornadoes", have been filmed and photographed on numerous occasions, that the downward and then upward motion of the white smoke is explained by the fact that the air flow inside the funnel is directed downward, while in the - often transparent - outer shell, the air is spiralling up. 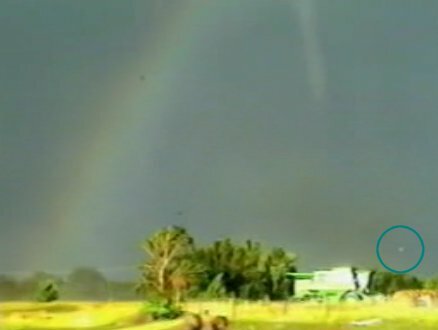 He notes that the "luminous blue-violet mist" that surrounded the object is explained because there exist several descriptions of nocturnal [this case is by day] tornados either having a distinct bluish or blue-white appearance or having a blue aura around them. 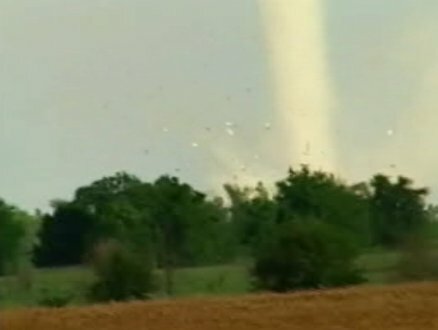 He notes that the "flashes of light" that came from the object or cloud are another element in favor rather than against the tornado hypothesis. 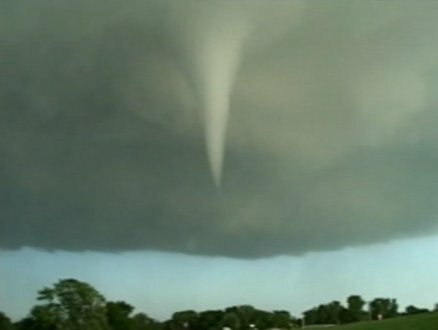 In close encounters with tornados, witnesses have often described streaks or flashes of lightning inside tornados. He notes that the "little metallic disk" that shone "like a mirror" and is described as "a brilliant ball of light" in the 1968 interview, points to a rare but not unprecedented phenomenon that sometimes accompanies tornados, namely ball lightning and that the scientific literature mentions several cases in which witnesses describe "flames" or "balls of fire" that are ejected from the base of tornado funnels. He notes that it must not be forgottent that the incident at Saint-Prouant took place in the midst [no] of a major wave of "flying saucer" reports that hit France in September and October 1954, and that "Grotesque misidentification of natural phenomena and common airborne objects were a daily matter in that period." And: "In those circumstances, a rare and impressive meteorological phenomenon is bound to stir the imagination. In this case not so much the imagination of the witnesses (who seem to have described what they saw truthfully and to the best of their abilities), but rather the imagination of the journalists and flying saucer writers who reported on the events." "Our opinion: A luminous funnel cloud, accompanied with a rope-like condensation trail and ball lightning." 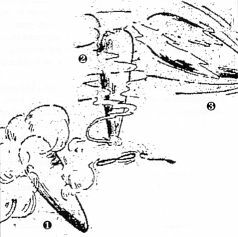 Images and further readings are provided: a sketch of the twin tornado seen in Toledo, Ohio, on April 11, 1965, from the September 9, 1966 issue of Science According to the witness who made the sketch, fireballs and orange streaks of lightning were ejected from the base of the funnels. The funnels themselves were surrounded by "a beautiful electric blue light". Pictures are also to be found in references given: VONNEGUT, B. & WEYER, James R., "Luminous Phenomena in Nocturnal Tornadoes" in Science, Vol. 153, 9 September 1966, pp. 1213-1220; VAUGHAN, Otha H. Jr., & VONNEGUT, Bernard, "Luminous electrical phenomena associated with nocturnal tornadoes in Huntsville, Ala., 3 April 1974" in the Bulletin of the American Meteorological Society, Vol. 57, No. 10, October 1976, pp. 1220-1224. A fine example of an impressive cigar-shaped funnel cloud that persisted some 40 minutes and had rope-like condensation funnels (waterspouts) developing and decaying around it, was photographed in the Skagerrak waters, south of Norway, on September 8, 1986. See Weather Vol. 42, No. 8, August 1987, p. 241. Wim van Utrecht provides this artist's impression of the object observed by Georges FORTIN and the comments: "In (1) the carrot-shaped cloud that emerges from the clouds, in (2) the trail of white smoke that is jetted out from the base of the "cloud", and in (3) the cloud back in a more horizontal position before it disappears." He specifies that the drawing is scanned here from the May 2006 issue of International UFO Reporter, and was originally published in the French paper France-Dimanche not long after the events. Jean Sider discusses the case of Saint-Prouant, the Vendée, France, September 13, 1954. He indicates that the witness is George Fortin, that the in investigation is by Dominique Jay and the Métayer abbot, for the GEPA group. He indicates that in the hamlet of La Gabelière at the end of the afternoon under a not very cloudy sky, the witness worked in a bean field when his attention was suddenly attracted by a small yellow white odd cloud in the carrot shape going down slowly from the sky, tilte 45° with the pointed end downwards. The phenomenon stopped at 50 meters of the witness and approximately 6 to 8 meters of the ground, details already showing that it could not be a a natural cloud. The size of the small strange gas mass is compared with that of a powerline transformer that the witness showed the investigators, a masonry out of concrete with a square base of 3 by 3 meters, and 10 meters in height approximately. During the descent a smoke escaped from the pointed end and circled up around the phenomenon while going up corkscrew-wise. Shortly after its immobilization, this small mass gas dissipated little by little and let appear a ball or a disc, shining, which always showed its same side opposite the witness, estimated from 35 to 40 cm in diameter. This object carried out a significant number of fast maneuvers and jerks, which consisted of a rectilinear move in another direction, with movements on the left, on the right, upwards, downwards, on a nonplane broken line. At the end the object climbed suddenly vertically and was lost od sight in altitude. The observation lasted about twenty minutes and was confirmed by other people who were in different places in the vicinity. Mr. Bonifait, electrician, did not see the disc, only the odd cloud which he noticed coming from the distance for he was working in height on a powerline. This cloud made him believe that a storm was going to burst, but he was very intrigued by the behavior of the phenomenon, completely unusual. He was only able to see its descent towards the ground, after that it disappeared from his sight, hidden by the trees. Jean Sider indicates that the source is Phénomènes Spatiaux, GEPA magazine, #18, 1968, pp. 26-28. He comments on that "Here there was no abduction, at least seemingly, for at that time nobody suspected that this type of incident can happen", and he wonders consequently what the purpose of the display offered to the witness was. *Sep. 14, 1954 - At 5:00 p.m. over 200 witnesses in St.-Prouant, Vendee department, France watched a cigar or carrot-shaped UFO as it emerged from a cloud, tilted toward the ground, hovered, and then elevated its front end quickly into a vertical position. It emitted vapor from its lower end. Next, a metallic disc-shaped object flew out, spun around the cigar, and then re-entered the mothership. (Sources: Aime Michel, Flying Saucers and the Straight Line Mystery, p. 23, Richard Hall, The UFO Evidence, p. 16; Thomas M. Olsen, The Reference to Outstanding UFO Reports, case # 44). Not looked for yet. Tornado. 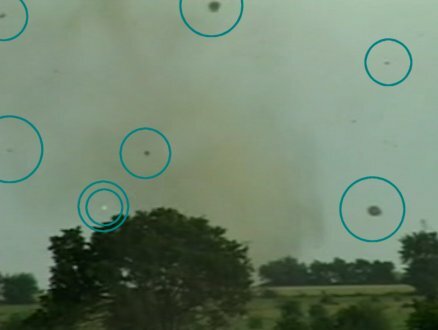 "Ball lightning" phenomena is not the usual case for lights seen in tornados. 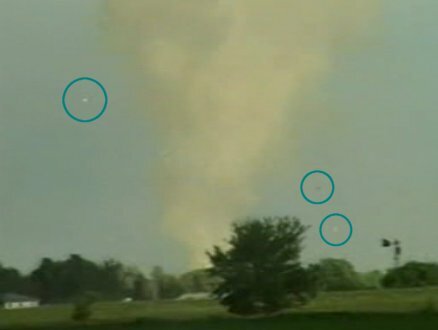 Numerous recent weather phenomena documentaries (tornados are now a quite popular subject), the very simple cause for these lights appears quite clearly: the tornado ripps of the power lines, power transformers, cause gas explosions, and this appears as flashes of light. In the Saint-Prouant case however, there is no mention at all of any such damages or any damages at all. So the tornado vortex must have hit grounds with no inhabited houses. "Minor" damages on power lines could well have gone unreported in the newspaper - the spectacular features of the "cigar" and "disc" were only late reported after all. [ro1] Article in the regional newspaper La Résistance de l'Ouest, Nantes, France, September 20, 1954. [fd1] Article in the national weekly newspaper France-Dimanche, Paris, France, September 1954. [fd2] Article in the national weekly newspaper France-Dimanche, Paris, France, October 24, 1954. [am1] "Flying Saucers and the Straight Line Mystery", livre par Aimé Michel, version anglaise de "Mystérieux Objets Célestes", S.G. Phillips éditeur, France, pp. 32-38, 1958. [mc1] "Les Apparitions de Martiens", book by Michel Carrouges (aka Louis Couturier), Fayard publisher, France, pp 220-223, 1963. 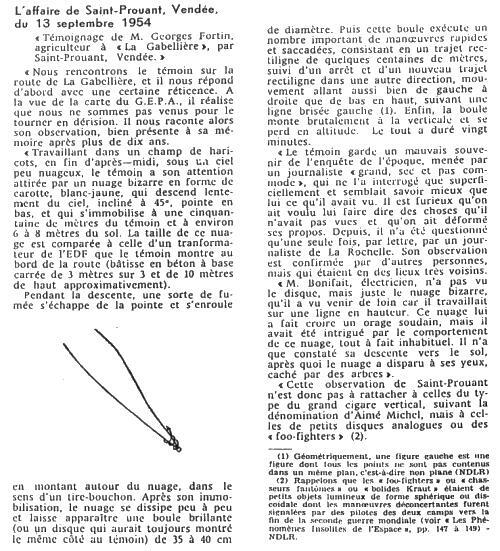 [ps1] "L'affaire de Saint-Prouant, Vendée, du 13 septembre 1954", article in GEPA's ufology magazine Phénomènes Spatiaux, #18, page 27, December 1968. [---] "Le 'cigare' de Saint-Prouant n'était-il qu'un nuage? ", article by Dominique Jay and R.P. Metayer, in the ufology bulletin Phénomènes Spatiaux, GEPA, France, #18, pp. 26-28, December 1968. [jv1] "Anatomy of a Phenomenon", book by Jacques Vallee, Tandem publishers, U-K., pp 67-68, 1974. [am1] "Mystérieux Objets Célestes", book by Aimé Michel, Seghers publisher, France, pp 32-38, 1977. [gi1] "Les Soucoupes Volantes - Le Grand Refus? ", book by Jean Giraud and the G.A.B.R.I.E.L. group, Michel Moutet publisher, France, pages 9,18, 1978. [---] Ufology magazine International UFO Reporter (IUR), CUFOS, USA, May 2006. [js1] "Mystère et Magie des Enlèvements", book by Jean Sider, Le Temps Présent publisher, France, pp 132-133, 2009. 0.1 Patrick Gross July 2, 2004 First published. 1.0 Patrick Gross May 25, 2009 Erratum: I indicated as a note that "The community of Saint-Prouant was renamed Talmont-Saint-Hilaire on January 1st, 1974". A reader informs me that "the community of St Prouant, in the Vendée, still bears this name. Talmont-saint-Hilaire does exist, but this village is located on the Atlantic coast, still in the Vendée, at at least 70 kms in straight line from St Prouant." 1.0 Patrick Gross May 25, 2009 Conversion from HTML to XHTML Strict. First formal version. Additions [go1], [lc1], [wu1]. 1.3 Patrick Gross October 22, 2011 Addition [js1]. 1.4 Patrick Gross November 2, 2014 Addition [ni1]. 1.5 Patrick Gross December 16, 2016 Additions [lg3].